I made my wonderful MIL a notebook for her first quilt class and had to decorate the front of it . I just pulled something I had downloaded on my computer for the front. 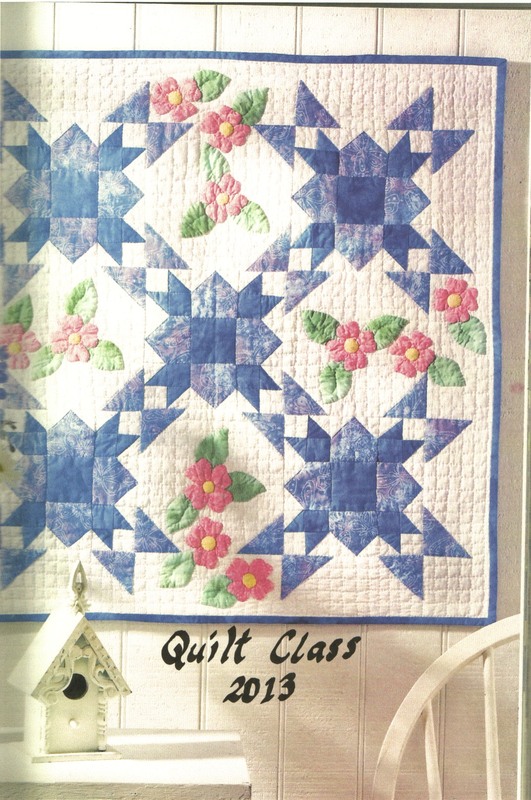 Well she loves this quilt and wants to make it and do you think I know where I found this beautiful quilt ? NOPE I have no idea please help if you can. Sorry I can't help you but it is gorgeous. It looks like a Weathervane and Snowball blocks plus some applique. Beautiful quilt. Tess, should be fairly easy to duplicate. Begin with the two blocks Peexy has suggested. Then find a dogwood blossom to copy. Maybe from a coloring book. Just drop your applique flowers in the snowball block and drop a few on hte other block.